Our Lodge - Ancient Landmark Lodge No. 5, A.F. & A.M. The first Masonic Lodge in the Territory of Minnesota was organized in St. Paul in 1849, under a dispensation from the Grand Lodge of Ohio, and was known as St. Paul Lodge No. 1. Brethren from all sections of the Union composed its membership and their ideas of Masonic work differed widely. Political feeling ran high in the community and even found its way within the tyled recesses of the Lodge. Torn asunder by discord and dissension the Lodge ceased work for about a year. Finally in October, 1852, St. Paul Lodge applied for and received a charter from the Grand Lodge of Ohio. Subsequently the Grand Lodge of -Minnesota was organized as previously related. Soon after the formation of the Grand Lodge, a number of brethren, some of them old residents and others recent arrivals in the town, and most of them not in affiliation with any Lodge in the territory, started a movement for the organization of a new Lodge. Time had not entirely effaced the differences in St. Paul Lodge; their Lodge room was situated in the extreme end of the town, and for these and other reasons it was felt that the organiza tion of a new Masonic Lodge was very much to be desired. The St. Paul of that day was divided into two hostile camps, known as Upper Town and Lower Town, and the rivalry existing between the two sections was most bitter and intense. Each fac tion resorted to the most desperate means to gain an advantage over the other and the jealousies and bickerings which resulted cast into insignificance the later-day- skirmishes between St. Paul and Minneapolis. St. Paul Lodge was located in Lower Town; the Upper Town brethren needed no stronger reason for the organiza tion of an Upper Town Lodge, and the movement soon took defin ite shape in the presentation of a request to St. Paul Lodge to give consent to the formation of a new Lodge in the city. The proposi tion was voted down; subsequently the request was again presented and received a majority of the votes, but it was held by one of the brethren that a two-thirds vote was necessary to pass it, and, lack ing one vote of the required number, the request was again refused. The brethren were not, however, to be easily discouraged in their project and on Saturday evening. Dec. 31, 1853, a meeting was held in the hall of Minnesota Chapter No. 1, R. A. M., for the purpose, as stated in the minutes of the meeting, "of associating Tm the purpose of forming a Lodge and to disseminate the genuine principles of Masonry." 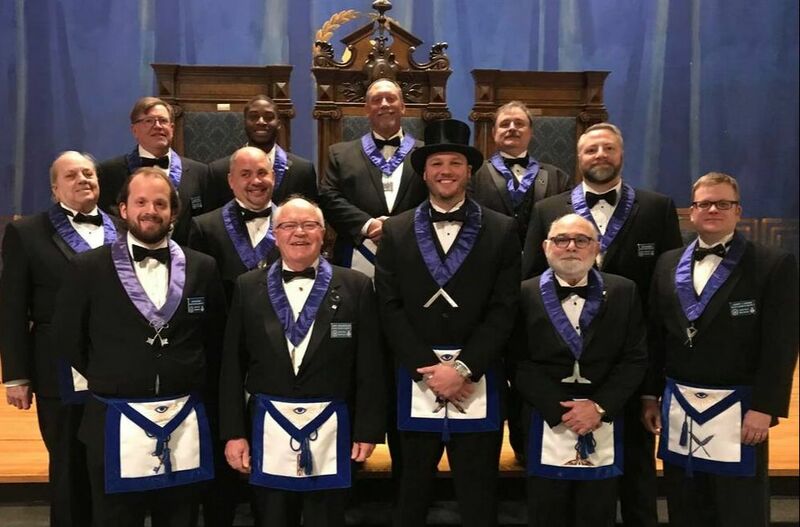 After some deliberation it was decided to petition the Grand Lodge of Minnesota to grant a charter under the name of Ancient Landmark Lodge No. 5, and recommended as its first officers, A. G. Chatfield, Worshipful Master; I. P. Wright, Senior Warden, and A. T. C. Pierson, Junior Warden. At the morning session of the Grand Lodge on Jan. 3, 1854, immediately after the question of granting a charter to Hennepin Lodge had been disposed of, Bro. W. H. Mower, Senior Warden of St. John's Lodge, presented a petition from the following named Master Masons, "known to him as worthy brethren," praying for a charter to open a new Lodge in St. Paul, by name of "Ancient Landmark," signed: Andrew G. Chatfield, James Y. Caldwell, C. D. Fillmore, R. Haus, P. T. Bradley, Geo. L. Becker, A. J. Morgan, Charles Rauch, Henry Morris, I. P. Wright, G. W. Biddle, A. T. Chamblin, A. T. C. Pierson. With the exception of Bro. Chamblin, who was a member of St. Paul Lodge, none of these brethren were at that time affiliated with any other Lodge in the territory. "Resolved, That the Grand Secretary be instructed to issue a charter to `Ancient Landmark Lodge No. 5,' upon the brethren depositing the usual fee, ($45.00)." Those voting affirmatively on this resolution were Grand Mas ter Ames, Senior Grand Warden Brawley. Grand Senior Deacon D. W. C. Dunwell. Grand Marshal Pierson and the representatives of St. John's Lodge and Cataract Lodge. Deputy Grand Master Goodrich cast the only negative vote. Yeas, 11 nays, 1. W. M., A. G. Chatfield. S. W., I. P. Wright. J. W., A. T. C. Pierson. S. D., J. Y. Caldwell. J. D., G. W. Biddle. "At a meeting of Ancient Landmark Lodge No. 5, held in their Lodge room at St. Paul, Jan. 3, 1854, P. M. Andrew G. Chatfield was elected W. M., I. P. Wright, S. W., and A. T. C. Pierson, J. W. and the several officers were installed in their respective offices at 12 o'clock M. in ample form. "In witness whereof, I have this 3rd day of January, A. D. 1854, subscribed my hand and seal. "GEO. L. BECKER, "Secretary Pro Tem, "Ancient Landmark Lodge No. 5." The credentials were received and the representatives were permitted to take their seats. Bro. A. T. C. Pierson, J. W., appeared and took his seat as a representative of Ancient Landmark Lodge NO. 5. This is the history of the organization of Ancient Landmark Lodge No. 5. All available sources have been drawn upon in its compilation, and great care has been taken to verify facts and dates as far as possible. It may be that the relevancy of some of the points touched on may be questioned, but the writer believes that the early history of Ancient Landmark Lodge is so intimately associated with most of the events that have been related that a history of the Lodge would be incomplete without some reference to them.